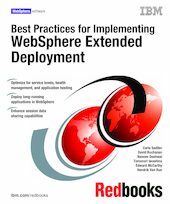 This IBM Redbooks publication looks at scenarios for using WebSphere Extended Deployment V6.0.2 and outlines procedures and best practices for these scenarios. Scenarios for operations optimization, long-running application extenders, and data-intensive application extenders are included. This book focuses on process, design, and usage guidelines, complimenting the "how to" information found in Using WebSphere Extended Deployment V6.0 To Build an On Demand Production Environment, SG24-7153. In addition, the business grid (batch and compute-intensive) capabilities are covered extensively including how to and best practice information. This book applies to WebSphere Extended Deployment V6.0.2 only.